I’m always, always cold. I know everyone says that, but honestly, pretty much the only time I’m not cold is when I’m lying on a warm rock on a hot day in direct sunlight. Maybe I’m part reptile – who knows. I went to Arizona a few years ago in the middle of the summer, and absolutely loved it, except for the fact that it was always too cold inside! Even in the summer, I sleep with a thick comforter. On warm summer evenings, I love to curl up with a blanket and drink hot tea. Fuzzy socks and thick sweaters are not seasonal attire in my opinion, and it’s never, ever too hot for soup. Mmmm, soup. Now that it’s autumn and the weather is a bit cooler, I can finally do all of these cozy, lovely things without people questioning my sanity! So, in the spirit of keeping warm without getting funny looks, here’s a delicious and oh-so-cozy fall soup recipe for you. It’s warm, comforting and actually good for you, so put on a few extra layers, wrap up in your softest blanket and enjoy a bowl. Like any good, hearty soup recipe, you can adapt this in a million different ways. I think it would be great with a little bit of spice, so you could add some red pepper flakes or a bit of cayenne. Another option would be to add some coconut milk at the end, for a sweeter, creamier soup. You can even puree some or all of this soup to change the consistency. It’s up to you! Rinse lentils and check for pebbles (or anything else that’s not supposed to be in there). In a large pot over medium-high, heat butter and olive oil until butter is completely melted. Cook onion, carrot, celery, garlic and ginger until vegetables are slightly softened – about 10 minutes. Add squash and cook for another 5 minutes. The onion should begin to brown a bit. Add spices (but not salt and pepper) and cook for 2-3 minutes, stirring frequently. Add lentils and water. Start by adding around 4 cups of water and add more as necessary to maintain a nice, thick consistency. Cover, reduce heat and simmer for 25-30 minutes or until the lentils are cooked. Add spinach and cook until wilted. Season to taste with salt, pepper and lemon juice. If you want, add a spoonful of brown sugar. It will bring out the sweetness of the squash a bit more, but it’s definitely not necessary. Serve plain, or with brown rice for a heartier meal. 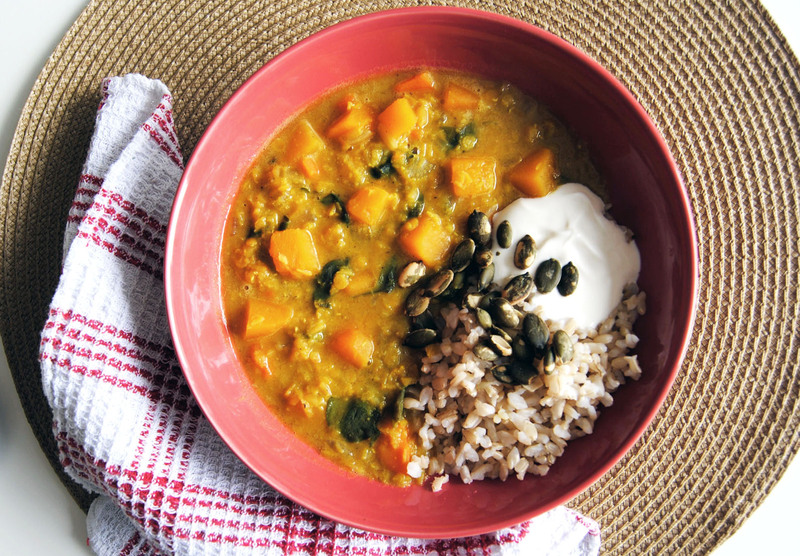 I loved this soup with brown rice, a dollop of greek yogurt, a sprinkling of pepitas and an extra squeeze of lemon juice.